A new recording will also be made when there is a change in other pertinent data such as runway change, instrument approach in use, etc. Example: "Dulles International information Sierra. 1300 zulu weather. Measured ceiling three thousand overcast. Visibility three, smoke. Temperature six eight. Wind three five zero at eight. Altimeter two niner niner two. ILS runway one right approach in use. Landing runway one right and left. Departure runway three zero. Armel VORTAC out of service. Advise you have Sierra"
Example: "[Agency], [Callsign], [Location], [Information], [Intentions]"
Example: "Danbury Tower, Cessna One Seven Two Seven Victor, 10 miles to the west, Information Sierra, inbound for landing"
Example: "Latest ceiling/visibility/altimeter/wind/(other conditions) will be issued by approach control/tower"
The weather broadcast frequency will be posted on sectional charts and/or Chart Supplement U.S. 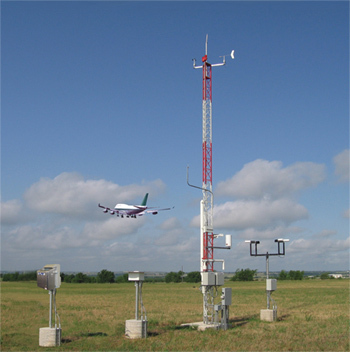 The ASOS/AWSS is the primary surface weather observing system of the U.S.
AWOS observations derived from an automated system will include the prefix "AUTO"
AWOS observations derived from an observer will include the prefix "OBSERVER WEATHER"
These sites, along with the hours of augmentation, are to be published in the Chart Supplement U.S. Example: "Bremerton National Airport automated weather observation, one four five six zulu"
Example: "Ravenswood Jackson County Airport automated weather observation, one four five six zulu"
Example: "Sault Ste. 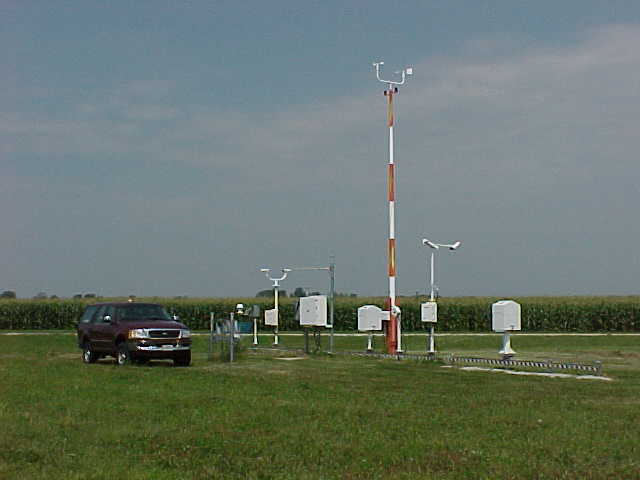 Marie, Chippewa County International Airport automated weather observation"
Example: "Sandusky, Cowley Field automated weather observation"
"Bremerton National Airport automated weather observation test, one four five six zulu"
"Bremerton National Airport automated weather observing system temporarily inoperative"
The lowest reportable visibility value in AWOS is "less than 1/4." It is announced as "VISIBILITY LESS THAN ONE QUARTER"
"Bremerton National Airport automated weather observation, one four five six zulu. Ceiling two thousand overcast"
"Bremerton National Airport automated weather observation, one four five six zulu. Indefinite ceiling two hundred, sky obscured"
"No clouds below one two thousand"
"Clear below one two thousand"
"Remarks ... density altitude, two thousand five hundred ... visibility variable between one and two ... wind direction variable between two four zero and three one zero ...observed weather ... thunderstorm moderate rain showers and fog ... thunderstorm overhead"
"Ceiling one thousand overcast ... visibility three ... precipitation ... temperature three zero, dew point missing ... wind calm ... altimeter three zero zero one"
"Remarks ... density altitude, two thousand five hundred ... visibility variable between one and two ... wind direction variable between two four zero and three one zero ... observer ceiling estimated two thousand broken ... observer temperature two, dew point minus five"
"Kotzebue information ALPHA. One six five five zulu. Wind, two one zero at five; visibility two, fog; ceiling one hundred overcast; temperature minus one two, dew point minus one four; altimeter three one zero five. Altimeter in excess of three one zero zero, high pressure altimeter setting procedures are in effect. Favored runway two six. 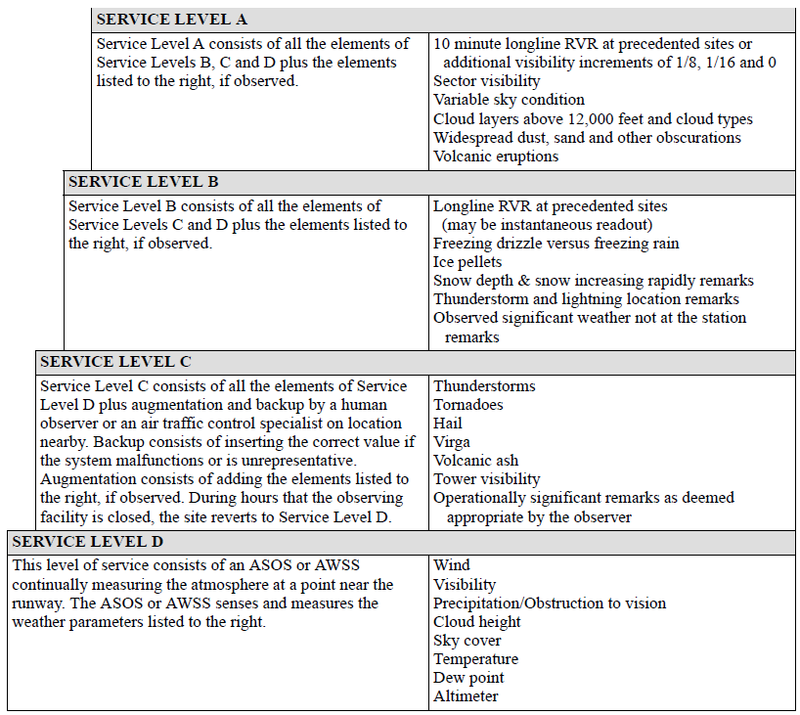 Weather in Kotzebue surface area is below V−F−R minima - an ATC clearance is required. Contact Kotzebue Radio on 123.6 for traffic advisories and advise intentions. Notice to Airmen, Hotham NDB out of service. Transcribed Weather Broadcast out of service. Advise on initial contact you have ALPHA"
NOTE: The absence of a sky condition or ceiling and/or visibility on Alaska FSS AFIS indicates a sky condition or ceiling of 5,000 feet or above and visibility of 5 miles or more. A remark may be made on the broadcast, "the weather is better than 5000 and 5"